Halloween, also known as All Hallows' Eve, is on Oct. 31 every year. While we now celebrate it as a holiday where children wear costumes and receive candy, Halloween has much deeper and more spiritual roots than this. Halloween is the modern-day celebration of a holiday that was actually called Samhain. Samhain was a Celtic festival dating back over 2,000 years. Samhain divided the year between the light half of the year (summer) and the dark half of the year (winter). Families would gather together and honor their ancestors. They believed it was a time when ghosts and spirits could walk among the living. This included bad spirits as well as good ones. They warded off those bad spirits by wearing masks as a disguise. They would have bonfires where they prepared food for themselves as well as for those ancestors with whom they wanted to reconnect. Eventually, Christians adapted Samhain into their religious calendar on Nov. 1, calling it All Saints' Day. They used this day to celebrate those that had crossed over into heaven. Interestingly, we can also find information about Halloween being celebrated among the Romans. During Roman times, Halloween was a celebration for the goddess Pomona, the goddess of fruitful abundance. This is where we get the popular Halloween game of bobbing for apples, which the Celtics also played at this time of year. When the Celtics celebrated Samhain, they believed that the spirits of the afterlife were able to walk the earth on those days. It's why they wore masks to protect themselves. Many Christian religions celebrate the lives of their passed loved ones around this time because it's believed that they're more able to see and hear our praises. No matter what your beliefs, it cannot be doubted that Halloween is a spiritual time. 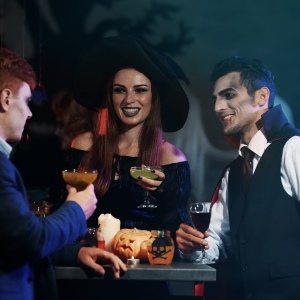 On the evening of Oct. 31, some say that there is a much better opportunity to connect with the Other Side than any other night of the year. Try communicating with the spirits at the witching hour, 3 a.m., when the veils between our worlds thin. Some even say that on Halloween, there is no veil. If you have never attempted to make connections with spirits before, Halloween is the best time to try for the first time. First, make sure that your energy is right. Turn off all of your electronics and burn candles for light instead. Pay attention to all five senses. What do you smell that's different, what sounds do you hear, what emotions are invoked? Write down all of the things that you feel are psychic impressions and interpret them later with a psychic medium. Be open to any connections you make and make your desires clear and specific. No matter how you choose to observe Halloween this year, it's nice to remember the history of this spiritual holiday and think about how you can incorporate that spirituality into your celebrations. If you ever want advice about how to make spiritual connections, on Halloween or throughout the year, speaking to a psychic online is a wonderful way to learn more.